Each of the bicycles your team builds will be given to an underprivileged child in your community. 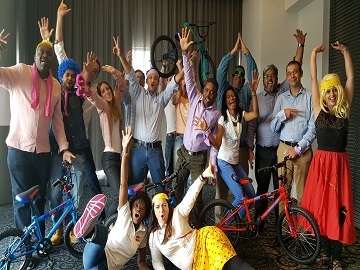 The Bicycle Build Off is a unique team building workshop and powerful team philanthropy experience which can be customized to meet all of your team goals. Please, DO NOT TELL YOUR TEAM about the bike building or the donation of the bikes to the kids before your event). Through participation in The Bicycle Build Off experience, your team will gain a stronger feeling of team connection and more powerful motivation to achieve personal and team goals. You will also learn and master powerful tools & techniques that will translate into improved teamwork, better communication, and increased productivity.